This information has been gathered from personal experience and is believed to be accurate but there is no guarantee that this is the case. Anyone using this information does so on the understanding that its use is completely at their own risk and that no liability for errors or omisions or consequential damage to persons or possessions will be accepted by the author or his agents. Prospective users should make their own considered judgement or seek specialist advice as to the accuracy or otherwise of any statements made before using this information in anyway. It seems to be a common problem with the heating system in the Griffith that it is impossible to turn off the heating completely, the warm or hot air that is continually blown into the cabin can make summer outings rather unbearable, this is certainly my experience. Heat regulation is achieved via a water valve in one of the heater matrix water pipes. The system uses an electric motor to move the valve, controlled by the top left hand heat knob on the heater panel. The position of the valve is tracked by a servo system that uses potentiometers (variable resistances) one attached to the motor spindle, the other to the heat control knob. 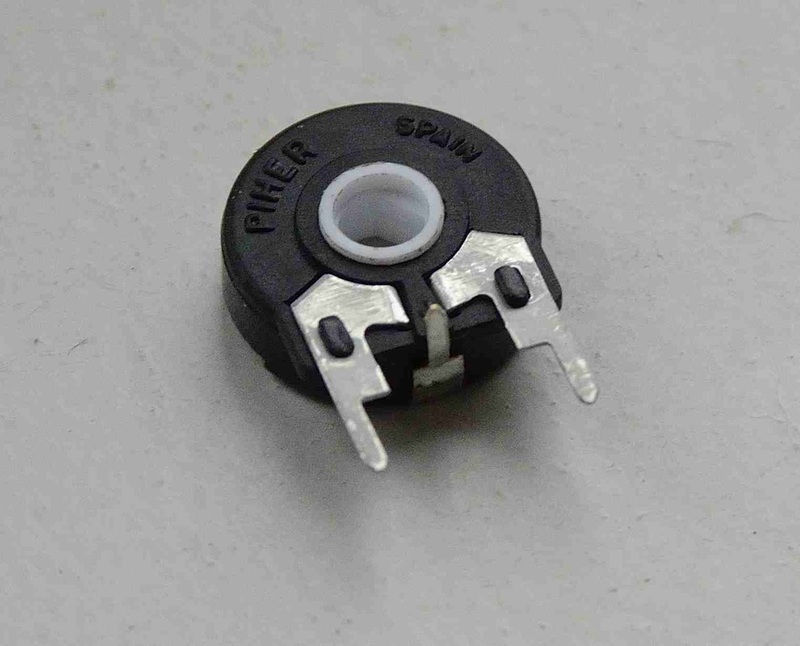 When the heater knob is rotated a potential difference is applied to the motor and it drives the valve until the rotational position of the two potentiometers is the same, i.e. if the heat knob is rotated say from 12 o-clock to ten-past the motor will drive the valve until its potentiometer also reaches ten-past, at this point the potential difference is zero so the motor then stops. In the simplified illustration below both potentiometers are midway so that 6 volts is applied to both sides of the motor, the potential difference is thus zero and the motor is at rest with the valve half open. A few pictures will hopefully explain the operation of the system. It is essential that when the heat control knob is at a minimum the valve is fully closed, this is frequently not the case. 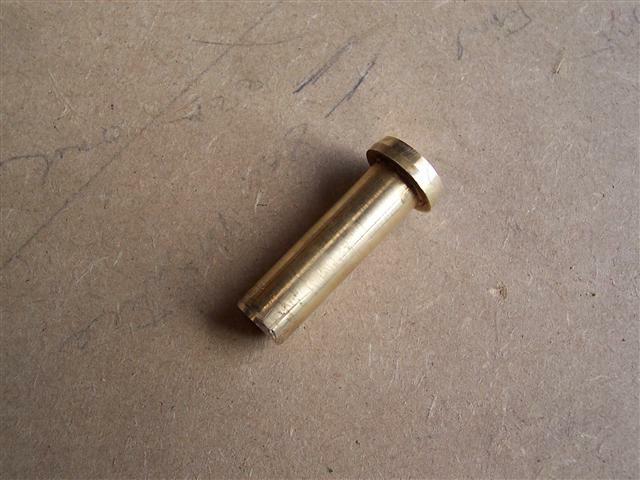 It is much easier to remove the valve to investigate. The basic water valve with the motor detached is shown above, note the white paint marks on the movable arm and the valve body. When the arm is in this position the valve should be fully closed, this may be checked by blowing into the valve. 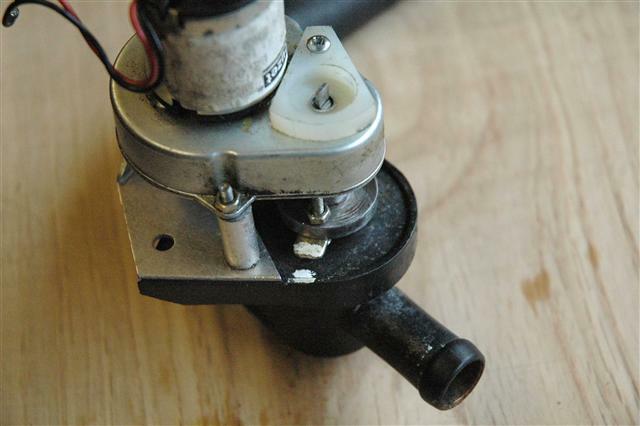 The Servo motor with its reduction gearbox is seen below,the drive pulley is secured on the shaft with a Philips headed bolt and then fixed to the valve arm by two small bolts (seen on the water valve arm above). The valve unit is fitted to the heater matrix rubber tube in the passengerfoot-well. 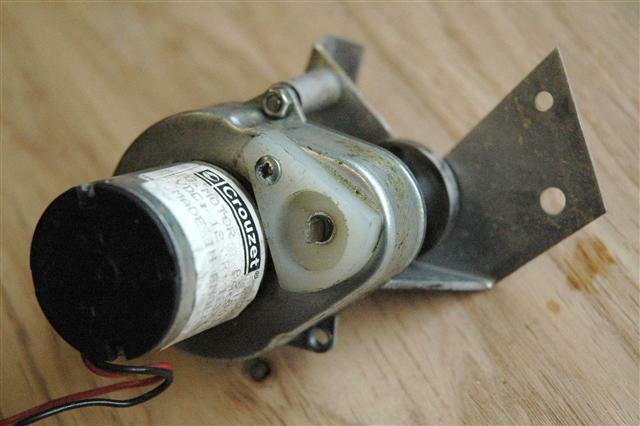 The motor servo 10 K Ohm potentiometer can be seen hanging freely with its blue/green/white connecting wires. The above sequence may have to be repeated a few times for accurate tracking. The original potentiometers are now unavailable. In fact they are no longer manufactured. A close alternative will fit after a small modification. 1. 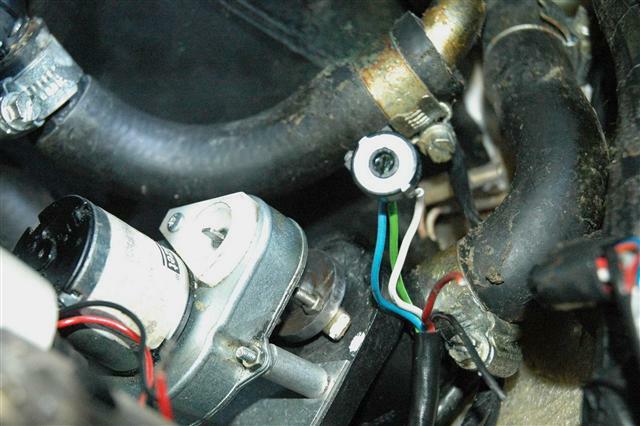 With the potentiometer disconnected from the valve assembly turn the heat control on the dash to minimum. 3. 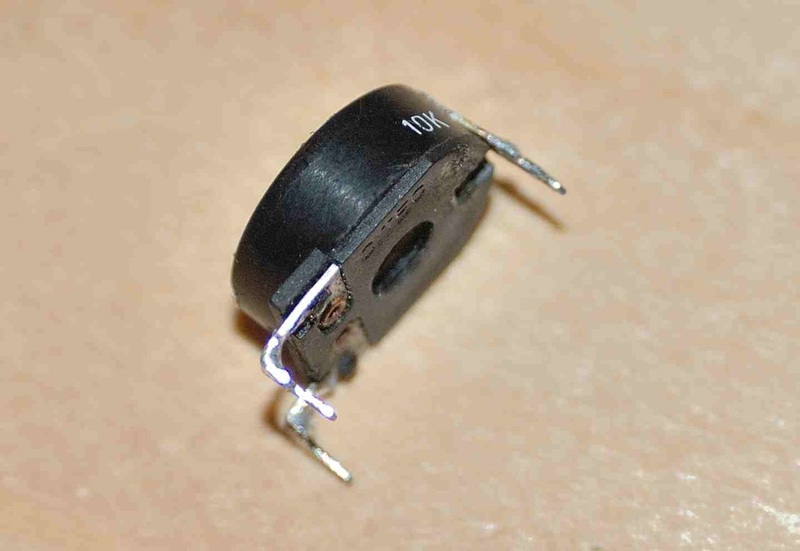 By adjusting the potentiometer with a screwdriver a point can be reached that stops the motor. 4. By observing the two white marks on the water valve it can be seen how far open or closed the valve now appears. 5. With small adjustments of the potentiometer the motor can be made to start or stop and turn clockwise or anticlockwise. 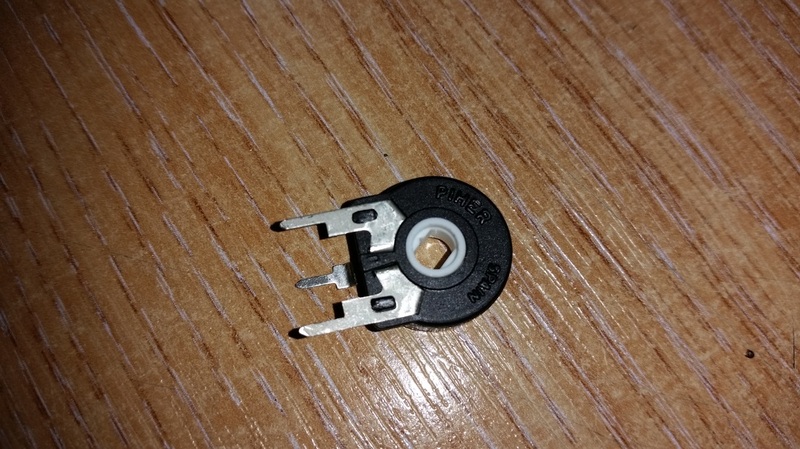 7.Carefully place the potentiometer in the nylon moulding (without moving its electrical position) paying special attention to locate the drive shaft. 8. Turn the heater control on the dash to maximum and the valve should open if the potentiometer has been correctly set up. 9. If the potentiomer is thrown out of the moulding you have probably wired the blue and green connections back to front. So unsolder and reverse them. Even with the water valve correctly aligned you may still find that the heater pumps out a fair amount of heat when at minimum. Some owners report cool air but most complain of uncontrolled warm air. Note: The above explanation is simplified as in practice the heater control unit HCU (electronic black box) is used to amplify the small current variations from the potentiometers to a level sufficient to drive the 12 volt motor. If the above does not fix your problem you could have a faulty HCU. Replacement is probably then the only solution. I found that even after careful alignment instead of permanent hot air, warm air was still circulated with the valve closed. It seems that despite the valve being closed heat still gets through to the matrix. 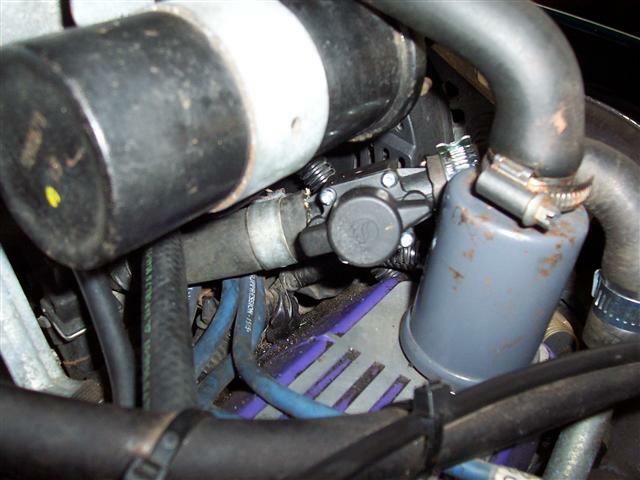 As a test I made up a temporary blanking plug and inserted it into the heater supply tube from the inlet manifold under the ignition coil, the result was cool air even during a long trip. Some early cars have a heater bypass arrangement so that water still circulates from the inlet manifold feed even if the electric valve has stopped the flow to the heater matrix. Steve Heath shows this in his Griffith/Chimera manual. 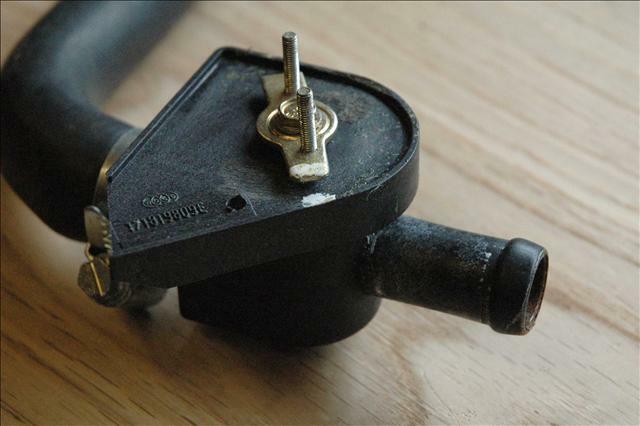 Later cars do not have the bypass so with the electric heater valve off no water can circulate from the inlet manifold feed so fitting a manual in-line tap to these cars should not cause any problems. As a permanent solution a suitable heater tap was found at Europa the 16mm version fitted my (1996 Griffith 500) heater tubes. The ignition coil was unbolted to allow access and a section of tube was cut out to allow the tap to be inserted, the tap fits conveniently and neatly under the coil. It is now a simple matter to effectively shut off the water supply in the summer, and at last some cool air.